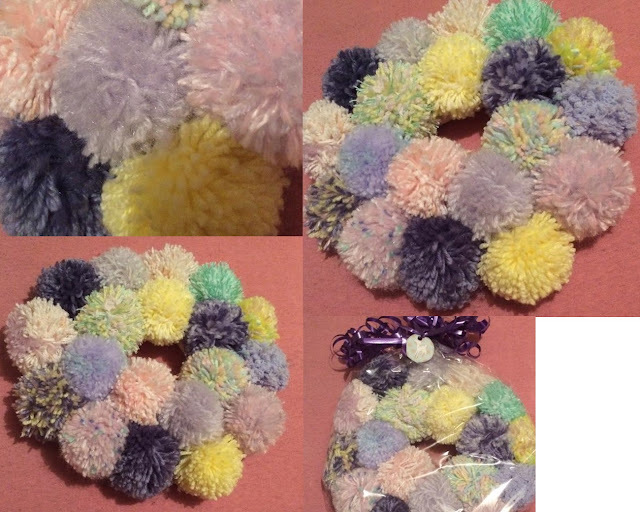 I received my lovely pom pom wreath from RR&J @ Etsy this weekend and I can't wait to show it to you guys. It's a custom one which was made to my specification - although I wasn't entirely sure on what exact colours I wanted so I asked for it to be pastel and left it in the capable hands of Rachel. Here it is! How cute. It is backed with vintage Laura Ashley fabric and there's a loop of coral ribbon for hanging. I love all the pom poms and how different colours and textures of wool has been used. And it's all been handmade by Rachel so kudos to her. This shop is a little bit different to others that I normally feature in that 10% of all proceeds go to the Cystic Fibrosis Trust which is a UK based charity that helps sufferers of Cystic Fibrosis and their families live their lives to the fullest! Cystic Fibrosis is a difficult disease and in the UK around 1 in 25 of us carries the faulty gene that causes Cystic Fibrosis. It's definitely a cause that deserves lots of pennies so go and give RR&J a visit and check out her cute pom pom goodies!